How to get there The climb is sign-posted for Théus from both Remollon (676m) and La Plaine de Théus (644m), while Mont Colombis is mentioned also at the first turn-off from the D 900b. This is one of the steepest climbs in all of France with close to 10% on average for more than 11 km. At Théus the steepness starts (one could possible take a slightly steeper local road through the village also). Keep right at Le Poët and soon you will arrive at an area called Salle du Bal des Demoiselles Coiffées with earth pyramids (the only such place I can think of in France). Higher up you enter the woods and eventually you reach the antenna at the top of the mountain. 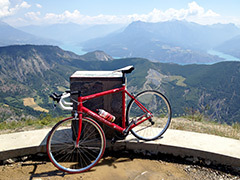 The road continues 250m gently down from the highest point to a viewpoint area with great views over the Lac de Serre-Ponçon. Other comments The climb is never terribly steep. It would gain full points on views if it had been still nicer along the climb as the top point is one of the best viewpoints you can find. Théus had no shop or bar, so bring enough water along. The gravel roads down north (like the one via La Croix de Prés and Gapian) are likely not that good, so I recommend going back down the same way.